Party food ideas are everywhere. But you want to be a little different, right? Basically, you want to give everyone a memorable experience when they walk away from your snack table. 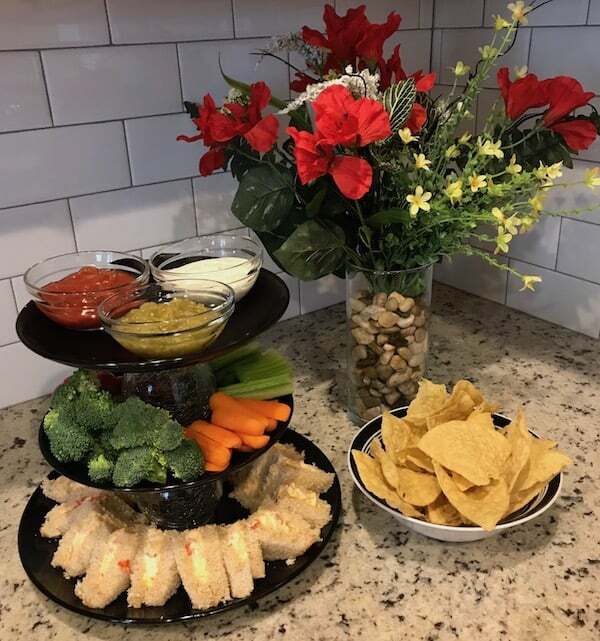 In addition to the expected chips and dip, you want to offer something no one else has. I’ve certainly been there, so I’ve come up with a few things that are a little different. And not a single one of my party food ideas is difficult to make. Since I thought it would be fun to share other people’s party food ideas, I’m including some here. Pick one or two to add to your snack table. Or choose all of them. After all, it’s your party, so you can do what you want. 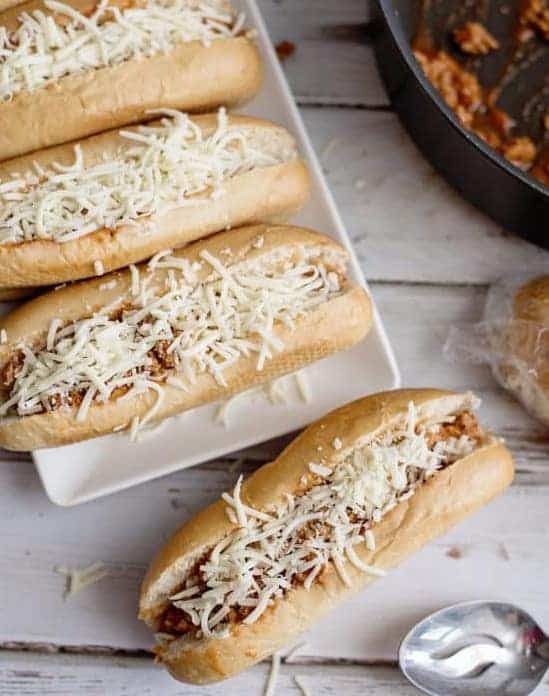 Whether you’re hosting a Super Bowl party, holiday event, birthday party or any other type of event, these party food ideas will give you some great options to feed your guests. Or if you are a guest, you can bring one of them to add to the snack table. Snack party food ideas are the easiest to make. Instead of having to worry about a full meal, you just want to offer something yummy to munch on. 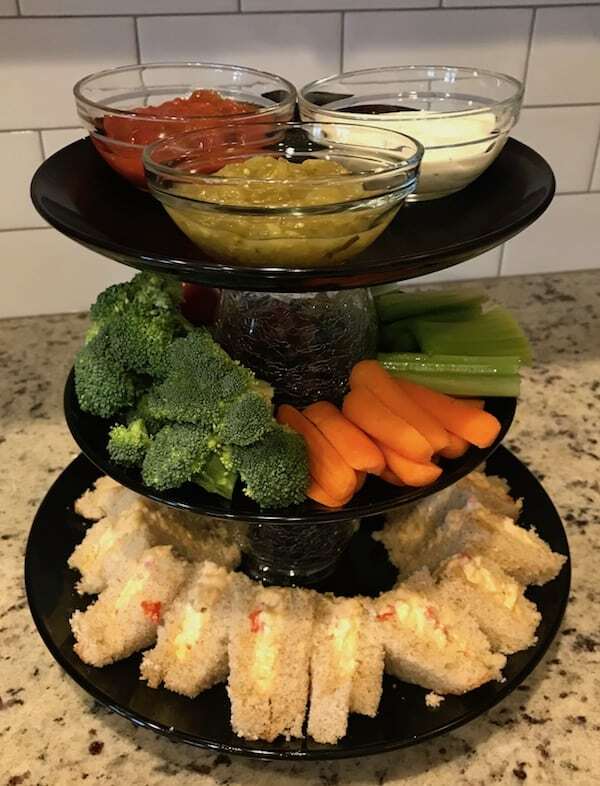 Party Platter – Fill a decorative serving piece like this 3-tiered party platter I made with sandwiches, veggies, and dip. Add a bowl of chips, and everything else you offer is a bonus. 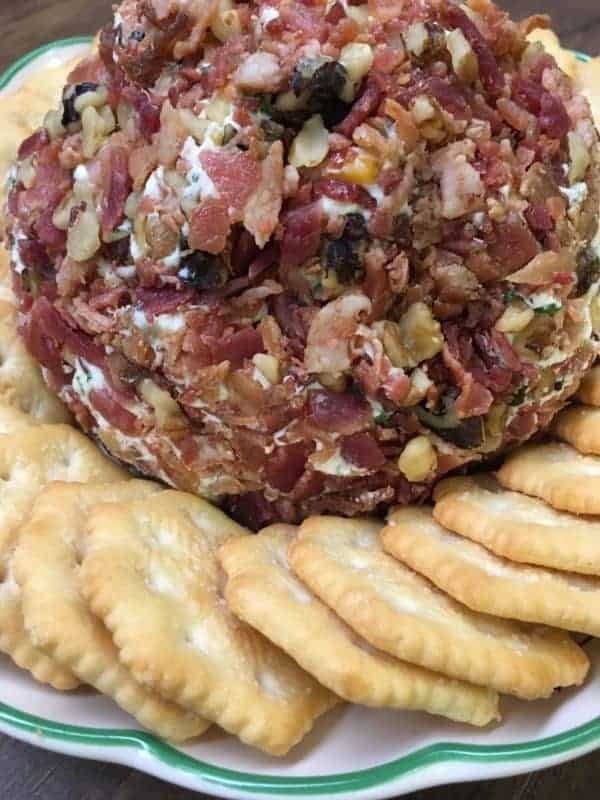 Cheese Ball – Another party food idea is this delicious cheese ball that you can make in advance. It’s different from any cheese balls you’ll find in the store, but it’s super easy to make. Put out a variety of crackers, and watch everyone devour it. 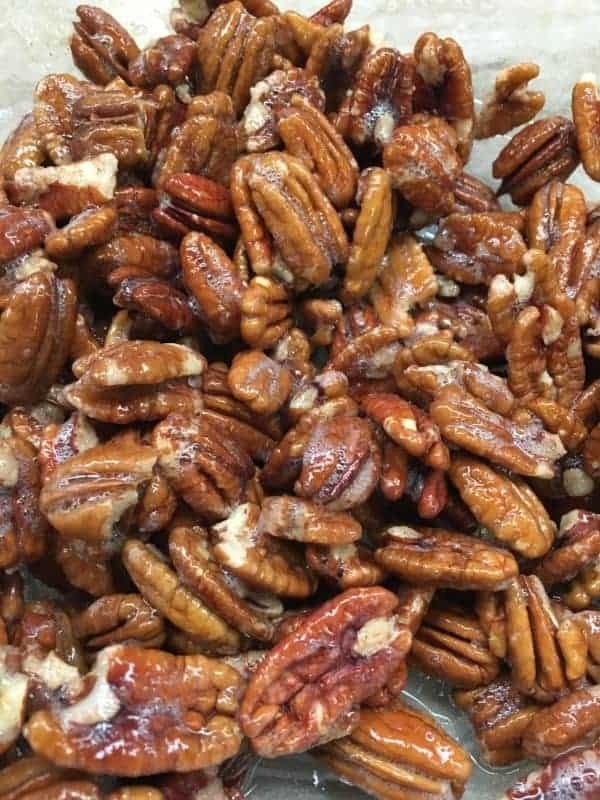 Candied Pecans – As the saying goes, “Sometimes you feel like a nut,” your guests will love these candied pecans. You’d better make enough of them because if you don’t, you will run out. This is one of those party food ideas that everyone will want to copy. So decide in advance whether or not you want to share the recipe. Party Mix – The very definition of this party food idea is to mix the ingredients you like. 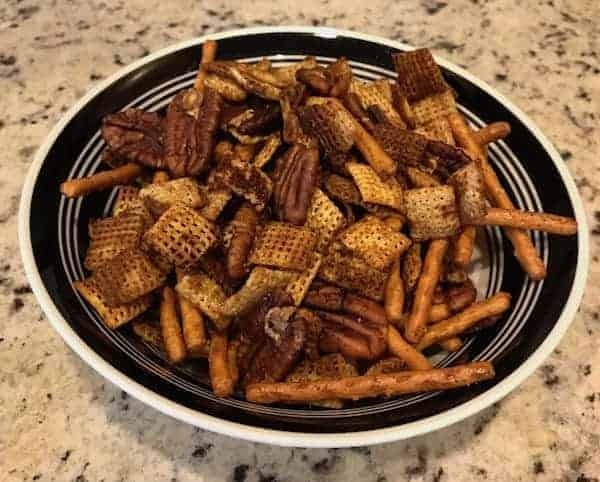 Although my party mix is similar to the traditional one you can buy in a bag, it’s gluten-free. But feel free to add, subtract, or swap out whatever you want. 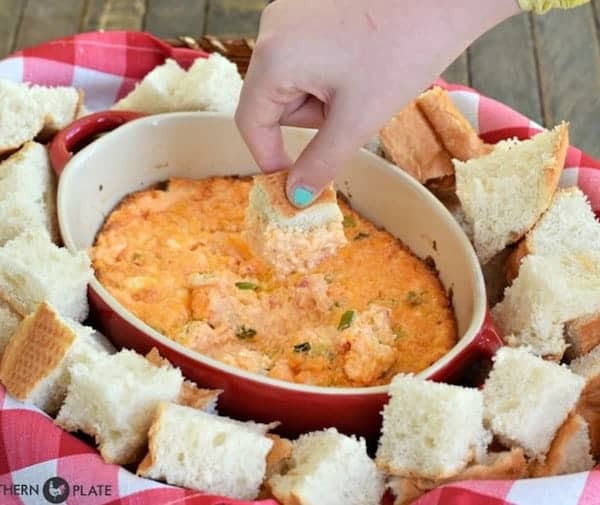 Melty Cheese Dip – Ooey gooey goodness is the best way to describe this party food idea. Dip chunks of bread, pork rinds, chips, or whatever else you like into it. Without a doubt, you’ll need to make a huge batch of this delectable recipe. 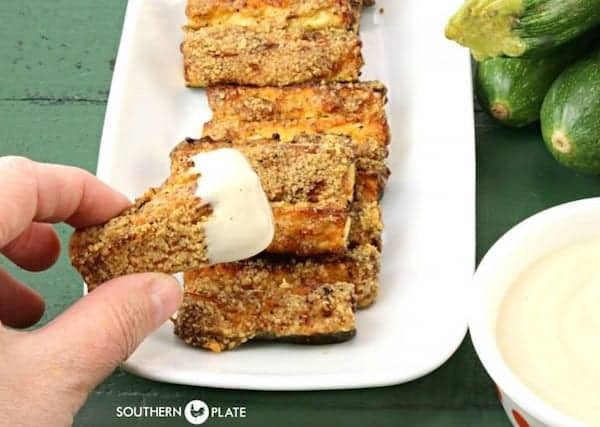 Zucchini Fries – Delightfully delicious, no one will know these are actually good for you. It’s up to you whether or not you want to tell anyone. Whether you want to provide dinner or substantial munchies, your guests will think you worked on these for hours. You certainly don’t have to tell them any different. These party food ideas will give you tons of cred in the entertainment department. 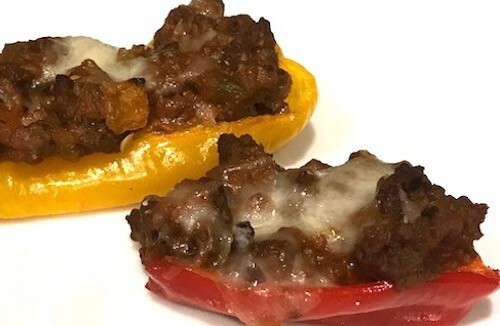 Mini Stuffed Peppers – Put these little boats of deliciousness on the party tray and watch them disappear lightning fast. Serve them with rice, and you have a full meal. Or simply add them to a tableful of offerings. Green Bean Bundles with Bacon – The blend of sweet and savory with these green beans will send your guests’ tastebuds into orbit. And the bacon will keep them coming back. This is definitely one of those party food ideas you’ll want to repeat over and over. 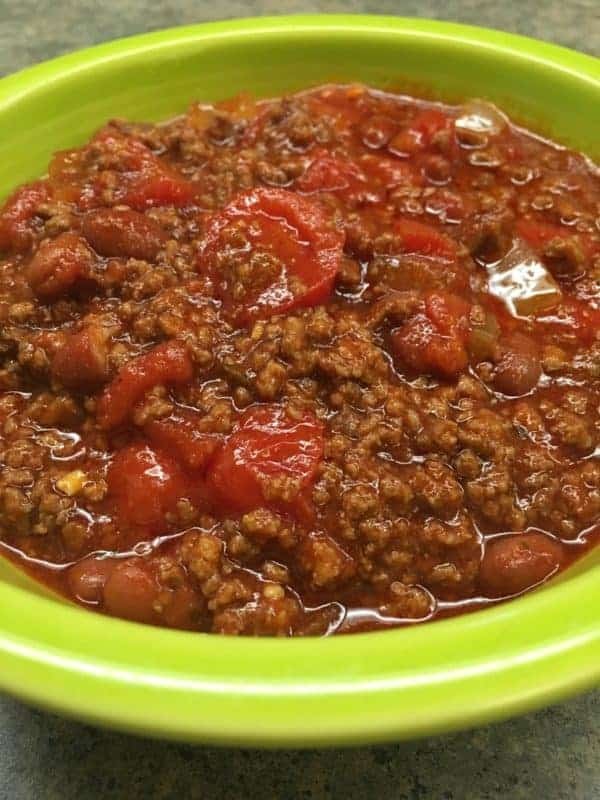 Delicious Homemade Chili – Regardless of how many people you have at your get-together, chili will be a welcome treat. This is, without a doubt, one of the best timeless party food ideas. Pizza Rolls – Not only are these a delicious dinner for the family they are the perfect party food. Treat your guests to a flavor sensation that will have them begging for the recipe. There’s nothing more exciting than a table filled with food. However, it doesn’t all have to be goodies you make from scratch. It’s important to realize that two or three homemade items and some chips will make you a hosting hero. 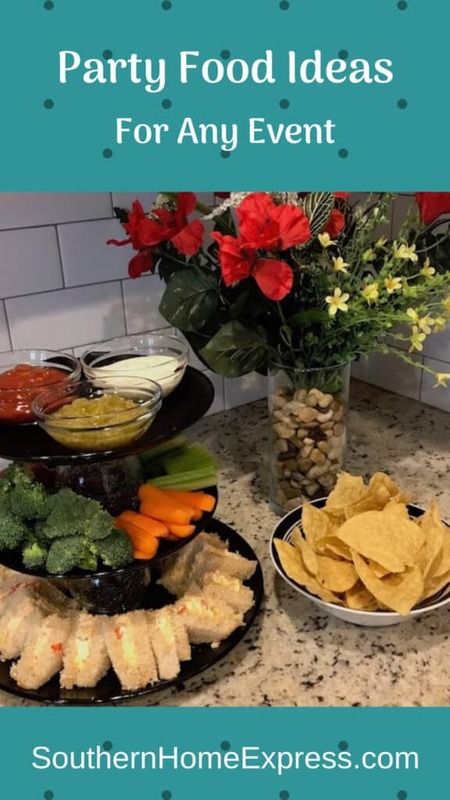 And then add some tasty dips to show your guests a little extra love. Most people enjoy going to parties for a number of reasons, including the food. However, it’s sometimes difficult to know what food to serve. What Food Do You Put on a Party Platter? You can put anything on it that fits, although finger foods are probably the best option. What is the Cheapest Food to Serve at a Party? If you’re hosting a dinner party, consider a baked potato bar or a pasta buffet. You can also serve sandwiches and chips. What Food Should I Bring to a Party? If you have a specialty that other people enjoy, by all means, bring it. By the same token, don’t stress over it. You might be the person who brings a bag of chips and store-bought dip, and that’s okay. Do you have one or two specialty foods you’re known for? Then by all means, prepare them and put them on the party table. Add one of the ideas listed above and offer some chips for an enviable snack table.